There are billion of users who love to use Gmail account for sending or receiving emails. All we know very well Gmail provide free email service and also provide search facility to find any specific messages. Lot of time we have to receive lot of messages from a particular email id. At this situation you want to quickly delete particular email address in Gmail. Lot of person either create a new Gmail account or delete or cancel Gmail account permanently but it is not a proper solution. If you get lot of unwanted emails from particular email id and you want to delete them quickly then you have to apply filter option. Lot of time we have to get regular emails from a particular email address. Due to which our email box is full with these emails. This article helps you to quickly delete particular email address in Gmail. This article quickly and automatically filter and trash all incoming emails which you get from a particular address to Gmail. You will be able to easily not only quickly delete particular email address in Gmail but also stop these emails to store them into the Inbox of your Gmail account. When you paste particular email id in the search box you will get all the current and previous emails. 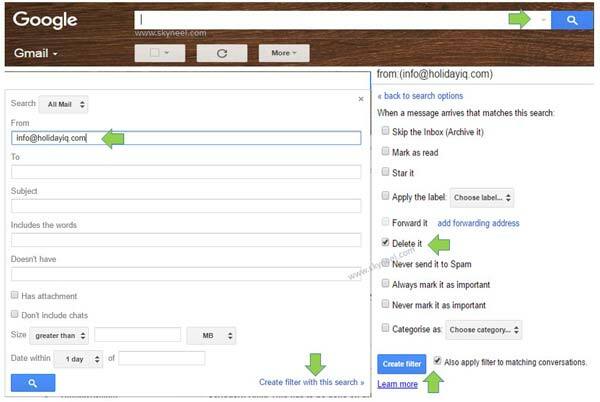 Now if you want to delete all these emails of particular email id either you have to select emails one by one or you can also set filter option to quickly delete particular email address in Gmail. If you will be disturb after receiving lot of emails from particular email id. With the help of this article you will able to quickly trash or delete particular email address in Gmail. Step 1. Open your Gmail account in which you will get bulk of emails from particular email id. Step 2: Select and copy the particular email address from which you get lot of emails. Step 3: Click on the Show Search options box which is placed on the top part of all received incoming mails. Step 4: Paste the email address in From address bar. Now, click on the “Create filter with this search” option. Step 5: If you want to skip the email in your Inbox then you have to turn on “Skip the Inbox (Archive it)”. If you want to permanently delete all incoming mails of particular email id then turn on “Delete it” option. If you already have lot of previous emails of particular id and now also want to delete them then turn on “Also apply filter to matching conversations”. Step 6: Click on the “Create filter” option. There are lot of Gmail users which face that type of problems and want a quick and better solution to overcome this type of situation. This article helps your to quickly delete particular email address in Gmail account. If you have any suggestion regarding this article then write us in the comment box. Thanks to all.